Let us introduce this beautiful free typeface to you: Beach. 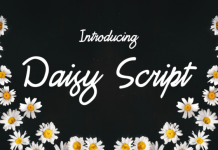 The Beach Script is a free lovely modern script with a fresh look with a handmade calligraphy style. It has beautiful decorative characters and a dancing baseline. This font is just pefect for logo’s, quotes, posters, t-shirts, invitations, greeting cards and so on. Use this font to create beautiful logo designs or for branding. The typeface also looks great on promotional products, like t-shirts. You can also look this handwritten script font for quotes, cards or posters. The font comes with a whopping 200 + glyphs. The alternative characters were divided into several Open Type features such as Swash, Stylistic Sets, Stylistic Alternates, Contextual Alternates. You can access these features by using programs such as Adobe Photoshop and Adobe Illustrator. If you don’t have a program that supports OpenType features , you can access all the alternate glyphs using the Windows Character Map or using the Font Book on the Mac. A Commercial Licence is also included. Download this beautiful free script font at Fontbundles.net.